Decoherence is the effect that causes a quantum system to behave classically. The most known of this kind of effects is due to environment where the interaction of an open quantum system with its surrounding is the reason for the loss of quantum coherence. This effect is well-proven on an experimental ground and must be considered acquired knowledge. On the other side, it is a correct scientific question to ask if a closed quantum system ever displays classical behavior for some reason. I have already put forward my take in this blog (see here). This week, on Physical Review Letters (see here and here), it is appeared a paper showing how intrinsic decoherence comes out in an experimental setup of two coupled kicked rotors. Kicked rotors are the epitome of studies on classical chaos and corresponding quantum behavior. It is known that, classically, such a system display diffusion above a certain threshold, firstly computed by Boris Chirikov. The corresponding quantum system localizes instead when its classical counterpart is chaotic. This is the hallmark of a proper quantum behavior that refrains from chaos proper to classical nonlinear systems. The main reason is that the Schrödinger equation is just linear and superposition principle applies. On 1988, S. Adachi, M. Toda, and K. Ikeda showed a real beautiful result that two of such coupled systems lose quantum coherence (see here). The paper by Bryce Gadway, Jeremy Reeves, Ludwig Krinner, and Dominik Schneble (see here) is an experimental proof of the fact that the original theoretical result is a correct insight and we have again a proof that environmental decoherence is not all the story. An interesting recount is given here. This paper is really striking and open the door to a new class of experiments where closed quantum systems, possibly with a lot of systems involved, will be studied to give a full understanding of the quantum-classical transition. 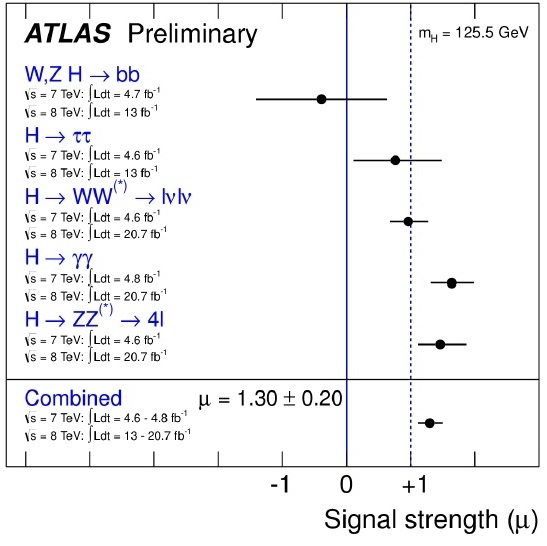 For the sake of completeness I give here also the same results from ATLAS at the same conference that, instead, seems to go the other way round obtaining overall and this is already an interesting matter. 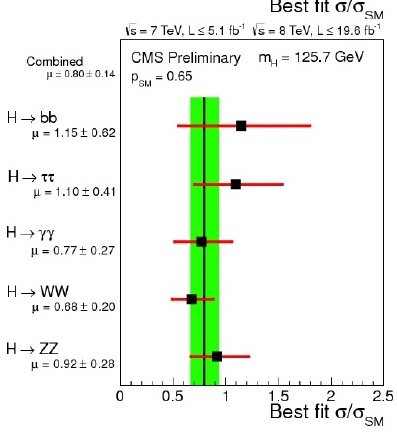 At CMS, new physics beyond the Standard Model is peeping out and, more inteestingly, the Higgs model tends to be a conformal one. If this is true, supersymmetry is an inescapable consequence (see here). I would like to conclude citing the papers of other people working on this model and that will be largely cited in the foreseeable future (see here and here). Today, I made a serious mistake. I have sent again a rejected paper to the same journal. The point is that this is the kind of journal that has several Editors that can manage papers. So, one could improperly think that a rejected paper sent to different Editors could in the end go through. The Editor that received my paper did not even think to an error and called for a bad practice warning the Editor in Chief of the journal. I never applied this practice. The reason is that I have currently about 70 papers published in peer-reviewed journals and so, I have the greatest respect for the work of people that permitted to achieve this result of mine. Worst, I have written more than one hundred papers and a part of them is unpublished for a reason or the other and generally I am in difficulty to get trace of all of this. Indeed, it is quite common practice to send a rejected paper to another journal. The paper I sent out was written about three years ago and I have forgotten about it. In these day, I am revisiting my computations on the scalar field theory both classically and quantum and turned back to this article. Wrongly, I thought I had not sent it to this journal before and that is it. American Physical Society obviated to this problem by producing a database, available to authors, with all their history. In other cases this is practically impossible to trace and when the number of papers is overwhelming an error can occur. So, my apologize for this and I do it publicly. You are currently browsing the The Gauge Connection blog archives for May, 2013.